The stories of Autumn, Hunter and Summer, Kristina's three oldest children, are provoking, harsh, and sad. We see their childhoods from their point of view, and we feel their pain, their joy, and their ties, to a mother they don't really see or know. Hopkins tells us (shows us) how their mother's meth addiction fuels their dysfunction, how they are predisposed to alcohol, anger, anxiety---all because of the woman who brought them into the world. But this book holds out hope that these teens are strong, working against the odds to make their worlds a better place with each other, even including and accepting their mother, Kristina with all of her shortcomings. 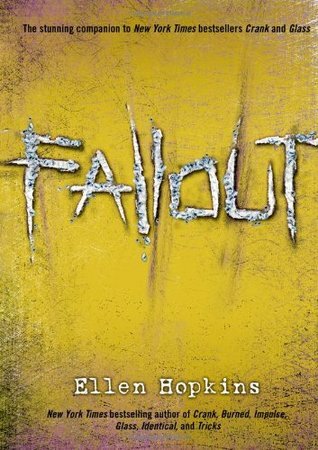 Sign into Goodreads to see if any of your friends have read Fallout. I am on hold for this one. Can't wait! I thought this was a fantastic end to the Kristina books! As much as I love them I'm thrilled she's not going to keep them going. Yes, I agree and the students just love them too! I purchased the new one last week and a student came in 3 times to see when he could get it out---he was in at 7am today!!! We had it for him by lunch, he was one happy camper!!! That's so great! That's such an awesome thing to hear!! I know I would have loved it as a kid so I can totally believe the kids are going crazy for it. That must be such a pleasure to hand a kid that excited a book they've been waiting for! Yes it is and see their faces light up!